GERMAN CHANCELLOR ANGELA Merkel will go head-to-head today with her challenger Martin Schulz in their only television debate before this month’s general elections, in a crucial match that could sway millions of voters. Analysts call it the “last chance” for the straight-talking Schulz to turn his campaign around and halt a devastating popularity slide since January, when he took the helm of the Social Democratic Party (SDP). 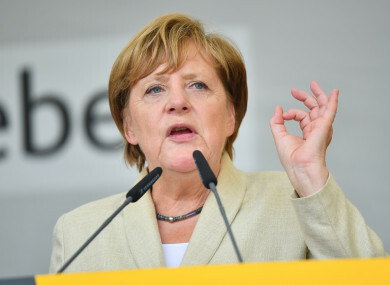 Although Merkel’s Christian Democratic Union of Germany (CDU) party and their Bavarian CSU allies hold a comfortable 14-percentage point lead over Schulz’s SPD, polls have found that almost one in two eligible voters are still undecided ahead of the 24 September vote. Today’s 90-minute primetime showdown will be above all a clash of personalities – an illustration in newspaper Die Zeit showed Schulz, holding a saw and dressed in workman’s overalls, trying to dismantle the throne of a regal “Queen Merkel”. Schulz, former European Parliament chief, told the DPA news agency that his strategy did not include any personal attacks against Merkel, but that he fully intended to show that his party, as opposed to the CDU, has a programme. “The CDU has a concept, and that’s Angela Merkel. That’s supposedly enough for you all. We have a concept for the future of the next generation in this country,” Schulz said. The SPD leader has repeatedly accused Europe’s most powerful woman of “systematically refusing debate on the future of the country” and lulling voters to sleep by avoiding a clear stance. Merkel, who has mostly avoided referring to Schulz or any other election candidate by name, has so far refused to be drawn into a combative debate. “If an election campaign is defined as good only when people insult each other, then that’s not my idea of what an election campaign is about,” she said at her annual summer press conference. To critics who argue that the campaign is boring, Merkel would only say that “for me, it is not boring. It is exciting and interesting. I meet new people every day”. A highlight of Germany’s electoral campaign season, the so-called “television duel” is expected to draw almost 30 million viewers – or around half of the electorate, according to a poll by research firm Forsa, commissioned by Stern magazine. One in five said the debate could swing their vote, the survey found. The two candidates will spar on topics thrown at them by four seasoned TV presenters, but beyond the content of the debate, they will also be scrutinised for their body language. Just days before the event, the chancellery was accused of rigging the format in Merkel’s favour by threatening to stay away after the broadcasters proposed a more adversarial set-up. Critics said Merkel had blocked changes that would have allowed for greater spontaneity and deeper debate during the show. “The TV duel format, like spontaneity and eloquence, is not quite Merkel’s strength,” Forsa head Manfred Guellner told the business newspaper Handelsblatt, adding that “Schulz can benefit” from the show. Merkel is no stranger to the format, having already fought three previous general elections. But surveys immediately after each of the last three TV debates showed a popularity bounce for Merkel’s opponents. In particular, Schulz may be hoping to emulate the debate success of Gerhard Schroeder, who as SPD chancellor in 2005 drastically narrowed Merkel’s double-digit lead to a sliver — though he ended up losing the election. But political analyst Oskar Niedermayer warned that Schulz would have to watch his tone. “It has been seen lately that he is becoming even more aggressive, but if he oversteps the mark, that can turn against him because Germans won’t like it,” said the analyst. Schulz himself voiced confidence, saying on Friday he has not been unnerved by his opponent’s bid to swing the debate format her way. Email “A debate today is Merkel's opponent's 'last chance' to attract voters in German elections”. Feedback on “A debate today is Merkel's opponent's 'last chance' to attract voters in German elections”.